Jessie Tsifitsi at Edmiston in Greece sends in the news that she has signed a joint central agency with Pacifica Yachting for the sale of Baglietto's 38m motor yacht Alfa One and that this superyacht has also had a significant price reduction. 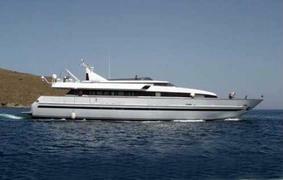 Built in 1991 to a design by Paolo Scanu, Alfa One accommodates 10 guests in a main deck master, VIP and double and twin cabins and cruises at 24 knots. Previously priced at €4.2 million, Alfa One is now asking €2.9 million (VAT paid).